The Academy conducts the Three-Minute Thesis Talk (3MTT) and Poster Competition in the month of August, every year, leading up to the IITB Convocation. This year, it was conducted on 9 August 2018. The venue for the 3MTT talks was the Academy Atrium. There was an illustrious panel of judges comprising of people from IIT Bombay, Monash University and Industry. The panel judged the talks and posters to identify the best talk and best poster. The posters were put on display in the Battery laboratory in the Academy ground floor. Our scholars were divided into two categories: those who have been in the program for less than 2 years and those who have been in the program for more than 2 years. The participants performed excellently. The judges were impressed with the quality of the talks, especially those who have been in the program for less than two years as they seem to have articulated their research project really well. The names of the winners were announced on the Oskar awards night ceremony which took place on the 12 August 2018 at Hotel Meluha in Hiranandani, Powai. The next event was the much eagerly awaited for our twenty nine graduating scholars. The Convocation Ceremony was held on the 11th August 2018 and the Chief Guest was the Hon’ble Prime Minister of India, Shri Narendra Modi. Guests of Honour were Shri Prakash Javadekar, Hon’ble Minister of Human Resource Development, Shri CH. Vidyasagar Rao, Governor of Maharashtra, and Shri Devendra Fadnavis, Chief Minister of Maharashtra. The Monash delegation who came to attend the ceremony comprised of dignitaries like Prof. Margaret Gardner (President & Vice-Chancellor), Mr. Shane Buggle (Council Member), Prof. Marc Parlange (Provost & Senior Vice-President), Prof. Matthew Gillespie (Vice-Provost, Faculty and Graduate Affairs), Prof. Zlatko Skrbis (Senior Pro Vice-Chancellor, Academic), Prof. Elizabeth Croft ( Dean, Faculty of Engineering), Ms. Michelle Lopez (Director, Monash Graduate Research Office), Mr. Damien Farell (Vice-President Advancement) and Mr. Joe Kabalan (Director, Stakeholder Relations & Engagement). Prof. Gardner conferred the Joint PhD degree on our twenty nine scholars. It is a matter of immense pride for the Academy that five of its graduates, Ramakrishna Bairi, Vignesh Kuduva, Subhadeep Das, Jhumur Banerjee and Jayesh Sonawane received the “Excellence in PhD Research” award from IIT Bombay. They received the award from none other than the Hon’ble PM, Shri Narendra Modi. Oskar night 2018, our Annual awards ceremony was held on 12 August, 2018 in Meluha The Fern, Hranandani Gardens, Powai. This night is an annual event of the Academy, to recognise and showcase the accomplishments of research scholars, staff and supervisors of the Academy throughout the year and in the 3 Minute Thesis Talk (3MTT) and poster presentation. The Academy Oskar night is graced by distinguished personalities from both India and Australia consisting of academic, industry and government professionals. The awards, consisting of Oskar statuettes and certificates are presented by the distinguished luminaries. The evening comprises reflections and speeches by the dignitaries, cultural programs by staff and students followed by a banquet. We had a number of cultural programs starting with an enthralling Bharatnatyam performance by Poornima, one of our research scholars. The audience was captivated with her graceful gestures. Pramantha, who has just joined the PhD program kept us mesmerized with his mellifluous Sarod recital. The Academy staff entertained the audience with an interpretative dance. The program ended with an announcement for all the Graduates to join for a group photo session with the luminaries. It was followed by a lavish banquet. The 3MTT is an event at which students present their research work in a three-minute talk. They also present their work through posters that are put up at the venue. A panel judges the talks and the posters to identify the best talk and best poster. The best presenters are given awards at the Oskar Night (our annual awards ceremony) held on Sunday, 13 August 2017. The panel of judges included members from Monash, IITB, and industry. We had an eminent list of judges-Ms Megan Phelan from Victorian Government, Mr Sydney Lobo from Tata Power, Dr Kumar Iyer from Hoganas, Mr David Pitt, Prof Zlatko Skrbis, Prof Pauline Nestor, Prof Marc Parlange from Monash University, Prof Vikram Vishal and Prof Swati Patankar from IIT Bombay. The students have just three minutes to present their research work; either motivation, plan, methodology for students in the first two years, or motivation, experiments and outcomes, for students in years 3 and 4 of their PhD. Kottermann and Thermofisher were the sponsors for the event. We had short presentations by their respective representatives. They also had stalls at the venue for showcasing their products. Prof Devang Khakhar (Director, IITB) and Prof Margaret Gardner (Vice-Chancellor and President, Monash University) conferred the Doctor of Philosophy degree to 15 of our students at the 55th Convocation ceremony held on 12 August 2017 at the Convocation Hall, IIT Bombay. Hon’ble Chief Minister of Goa Mr. Manohar Parrikar, was the Chief Guest for the occasion and he delivered the Convocation Address. “Do not limit yourself to a career path that is obvious and glamorous. And do not limit your idea of entrepreneurship to high market evaluations, stock options, NASDAQ and Forbes magazine. The idea of entrepreneurship is much more – bring a very powerful social angle to it. The challenges of the world are becoming more and more complex by the day, and the IITs have a moral responsibility to provide enterpriseand intellectual firepower to solve them. And when I say IITs, it is not the walls of IIT but the minds that have been shaped within the walls of IIT which should lead from the front, and create the path. “With the graduation of these 15 fine students we witness the ongoing achievement of another key milestone commemorating this unique, pioneering and bold joint venture between two great institutions. Today marks the continuation of a flow of talented students graduating under the auspices of the joint Academy. These are graduates who will fulfil the lofty ideals on which the Academy was established. I look forward to the day in the not too distant future when these graduates will make distinguished contributions to academia and industry. What we have built together is an impressive institution that all of us ought to be immensely proud of. I humbly take this opportunity to thank all you who have worked so hard and contributed so capably to build this joint Academy. It is now my honour, on this 55th Convocation ceremony for IIT Bombay and the 5th convocation ceremony that includes Monash University, to commend to you these 15 students to receive the dually awarded IITB and Monash joint PhD degree. Graduands, as Vice-Chancellor and President of Monash University, with the authority of Council, I admit you to the Doctor of Philosophy degree to which you are entitled”. Other dignitaries from Monash who attended the Convocation ceremony along with Prof. Murali Sastry (CEO) and Dr Nagabhushana(COO) were Dr Christine Nixon ( Deputy Chancellor), Prof.Marc Parlange (Deputy Vice-Chancellor Research and Provost), Prof. Zlatko Skrbis (Vice-Provost, Graduate Education), Prof. Pauline Nestor (Pro-Vice-Chancellor, Research), Mr David Pitt (Vice-President and CFO) and Prof. Susan Elliott (Deputy Vice-Chancellor and Vice-President, Education). The Oskar night is the annual awards ceremony of the Academy, to recognise and showcase the accomplishments of research scholars, staff and supervisors of the Academy throughout the year and in the 3 Minute Thesis Talk (3MTT) and poster presentation. The Academy Oskar night was graced by distinguished personalities from both India and Australia consisting of academic, industry and government professionals. The awards, consisting of Oskar statuettes, certificates and award cheques, are presented by the distinguished luminaries. The evening comprised of reflections and speeches by the dignitaries, few cultural programs followed by a banquet. The event was held at Meluha The fern hotel in Hiranandani Gardens, Powai. The Oskar awards night was sponsored by Tata Consultancy Services. 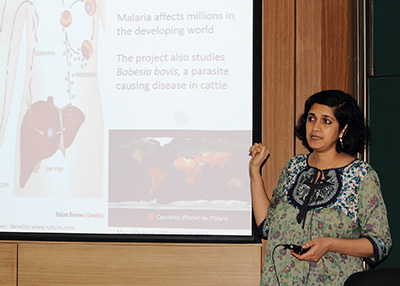 Dr. Rekha Singhal, Senior Scientist, TCS gave a brief presentation on the research work being carried out there. We were delighted to have her present an award to our Academy student along with Prof. Zlatko from Monash. From the year 2016, another award was announced which was for the ‘Best Employee of the Year’. This year, Ms Jayasree Thattayath and Mr Bharat Ingle were awarded the certificate and cheque as a recognition of their valuable contributions to the Academy. Countries across the globe are increasingly concerned about the finiteness of natural resources and how this impacts their ability to grow in a sustainable manner. ‘Reduce, recycle and reuse’—which forms the basis of sustainability—is a concept now taught in schools. Corporates are gradually realizing that life cycle analysis of products must move beyond ‘Cradle to Grave’ to ‘Cradle to Cradle’. India and Australia are impacted by these global trends and innovative solutions are being developed to tackle resource constraints. 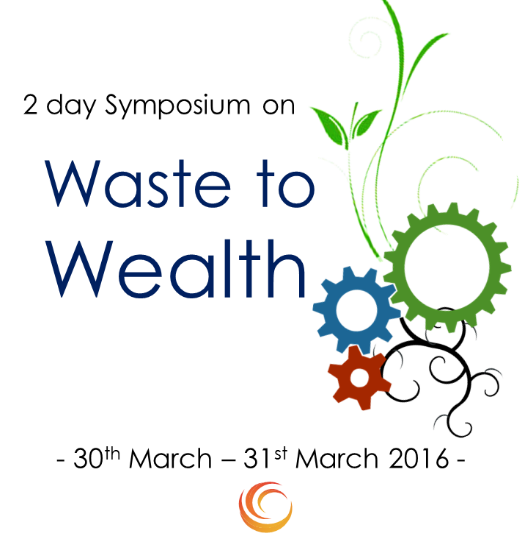 In order to bring together researchers, technologists and entrepreneurs (Academia and Industry) from Australia and India, the IITB-Monash Research Academy organized a two-day symposium on ‘Waste to Wealth’ on 30 and 31 March 2016 at the Victor Menezes Convention Centre at IIT Bombay. The aim was to bring together Indian and Australian scientists, technologists, entrepreneurs, social scientists, industry persons and policy makers to present new research findings, exchange novel ideas and technical know-how, discuss new developments and, finally, reflect on the challenges that lie ahead and the way forward to tackle them. The program was divided into eight sessions, comprising presentations by the invited speakers, followed by questions and discussions. Nine faculty members from Monash University, six from IIT Bombay and 12 industry experts presented their views, followed by brainstorming with participating delegates. The topics spanned core academic areas such as biotechnology, genetics, engineering and processing to application-based research outputs such as biofuels, functional foods, energy (gasification, pyrolysis), municipal solid waste management, fly-ash and farm waste utilization. Apart from pure scientific debates, discussions focused on environmental impacts and socio-economic perspectives on wealth creation from waste. As many as 75 delegates participated actively in the workshop. The sessions were broken up into a plenary lecture, two keynote speeches, 20 invited talks and a group discussion with elite panelists from across disciplines and profiles. The workshop was well received by the delegates; networking and one-on-one interactions continued during the tea and lunch breaks. The symposium came to a close with an open discussion on possible ways forward under the ambit of the IITB-Monash Research Academy for the ‘Waste to Wealth’ grand challenge and beyond. On Day 1, Prof. Murali Sastry, CEO of the IITB-Monash Research Academy, kicked off the proceedings with introductions to the themes of the day. Prof. Patrick Perlmutter (Monash), in his talk titled, ‘From food waste to water and wealth’, discussed solutions for global food waste problems based on a suite of new technologies. Highlights included significant contribution to mitigating land and stream pollution, substantial greenhouse gas (GHG) emission reductions, creating a new industry, new jobs and generating value added products on a large scale. Prof. Santosh Noronha (IITB), provided key results of his work that dealt with using genetic interventions towards making cellulosic ethanol and algal biodiesel processes commercially viable. The focus on improving the commercial feasibility was elaborated by Prof. Noronha through his research outcomes. Mr. Pramod Chaudhari, Executive President of Praj Industries, delivered a keynote speech on ‘Biomass opportunities in waste to wealth’, discussing the big picture of biomass-based fuels, energy, chemicals and value-added products and their impact on profitability, sustainability and future possibilities in the segment. Following the keynote speech, Prof. Akshat Tanksale (Monash) discussed his findings on converting waste biomass to intermediate chemicals. 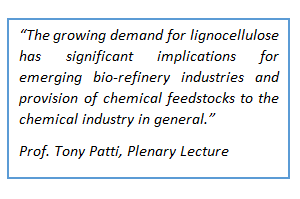 Technologies for converting lignocellulosic biomass to platform chemicals were discussed with a focus on green processes. Ramakrishna Singh, a PhD scholar at the Academy, presented preliminary findings of his research work on ‘Agro-residues as source of functional food fiber such as xylooligosaccharides (XOS)’, which are a part of an important class of probiotics. ost lunch, Prof. Antonio Patti (Monash), delivered the plenary lecture titled ‘Biomass Feedstocks – Challenges for Chemical Industries and Beyond’ wherein some of the broader issues related to lignocellulose supply were discussed and examples from by-product streams from both food production and consumption as well as other related industries were elaborated. Dr. Sudhir Dapurkar provided an overview of the activities at the Innovation Centre of Tata Chemicals Ltd., focusing on, ‘Outcomes related to gainful utilization of waste’. This was followed by Mr. Anand Gurav’s (Tata Power) talk on utilization of fly ash generated from coal combustion. Fly ash generated in India in the year 2015 was about 184 million tons and as per Mr. Gurav, is a big opportunity in disguise as it can be directed towards applications such as cement-making, ready mix concrete-making, concrete blocks, fly ash bricks, ceramic tiles, embankments for road construction, artificial soil, and artificial plywood, to name a few. Continuing on similar lines, Prof. Vanessa Wong (Monash) turned the focus towards waste generated from mine sites and how exposure of such waste could lead to environmental and ecological hazards. Prof. Wong discussed innovative solutions of making soil from a combination of solid wastes sourced from mines which are frequently nutrient poor and acidic, with nutrient-rich composted material produced from sewage treatment and alkaline wood chip waste. This would have the potential to lead to a soil suitable for mine rehabilitation, and, a soil fertile enough for seed germination and plant growth. 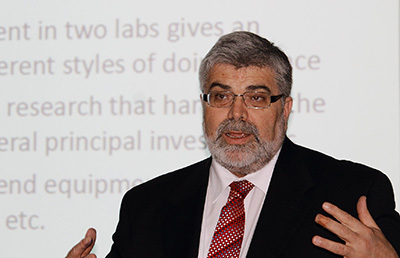 The Vice Provost of Research, Monash University, Prof. Ian Smith, gave an overview on integrated research platforms being developed at Monash University that would help industry deliver translational outcomes. Prof. Smith elaborated on approaches to Academia-Industry partnerships and how the integrated network of Monash technology research platforms have been a game-changer for university collaborations with industry. He showed that bringing together leading researchers from different fields across the university to engage with local, national, and global academic as well as, commercial research sectors could lead to better and optimal utilization of resources. After brief opening remarks by Prof. Sastry on Day Two, the session began with the second keynote talk of the symposium by Dr. Prasad Modak (Adjunct Professor and Executive President, Environmental Management Centre, India) titled ‘A Global Waste management outlook.’ Dr. Modak highlighted the major findings and outcomes of the Global Waste Management Outlook report, undertaken by the United Nations Environment Programme (UNEP), of which he was one of the four authors. In this humorous and animated talk, Dr. Modak shared his experiences of dealing with an international team on a subject like “waste” and the gravity of our ignorance on environmental implications of waste. Following the keynote talk, Mr. Salman Zafar, CEO of BioConsult, discussed the socio-economic perspective of municipal waste management and challenges in waste collection, waste transfer stations, material recovery facilities, recycling centers and decentralized waste-to-energy systems. 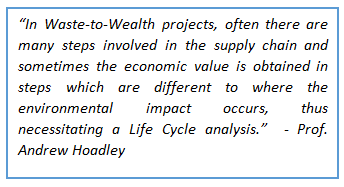 Prof. Andrew Hoadley (Monash) discussed the utilization of multi-objective optimization to assess waste-to-wealth projects. Prof. Sanjay Mahajani (IITB) presented his research on the management of garden waste. He presented his research group’s work that considered IIT Bombay campus as a test bed. The pilot study involved conversion of biomass waste into cooking gas, a survey of campus trees, pelletization processes and gasification of the bio-waste in down-draft reactors. Similarly, use of bio-waste such as wood chips and grape marc could be converted to jet fuel, as discussed by Prof. Alan Chaffee (Monash), who is currently investigating catalytic routes and process engineering for generating fuels with a high degree of purity and efficiency. Prof. Amit Arora of CTARA, IITB gave insights into his research on utilization of kitchen and horticultural waste such as fruit peels and vegetable stalks into value added bio-active products such as pectin, polyphenols and lipids which have applications in food, pharmaceuticals and the cosmetic industry. Prof. Arora demonstrated a unique bio-refinery based approach to recover bioactive compounds from kitchen and horticultural waste, which would also address the ever-growing municipal solid waste generation issue. Prof. Victoria Haritos (Monash), spoke on the utilization of kitchen and horticultural waste to obtain sugars and fermentable carbohydrates from lignocellulic biomass using enzymatic processes. These processes release sugars from fruit and vegetable waste that are greener and less capital-intensive than acid catalyzed steam processes, making them economically viable and sustainable. The sessions on gasification of farm waste by Prof. Mahajani, wood chips and grape marc to jet fuels by Prof. Chaffee, value-added chemicals from horticultural waste by Prof. Arora and sugar and fuel derived from kitchen waste by Prof. Haritos gave an exciting picture of the wealth that can be derived from waste, which otherwise causes negative environmental impact and significant cost for disposal. The next theme focused on utilization of municipal solid waste (MSW), one of the foremost challenges faced by cities and the countryside alike across the world. Mr. Pankaj Patel, head of Abellon Clean Energy Ltd. showcased his model for the city of Ahmedabad in Western India for the management of solid waste. Mr. Patel’s facility aims to process a thousand tons of municipal solid waste every dayto generate energy. Along with the technical details and know-how of the functioning of the waste processing and power generation plant, Mr. Patel also discussed issues such as land occupation by waste, ground and surface water pollution, health and environmental hazards and correlated them to social issues such as those of human scavengers and the human development index. Mr. Irfan Furniturewala, promoter of Hanjer Biotech Energies Pvt. Ltd., a company in the Municipal Solid Waste recycling business for the last 10 years, gave an overview of their activities and technologies that are used to handle about 80 million tons of solid waste across 18 units spread across nine states of India. Mr. Furniturewala also highlighted anaerobic biomethanation of the wet fraction from mixed municipal solid waste and fuel oil and gas production from mixed multilayered waste plastics. Mr. Rajiv Agarwal of Praj Industries Ltd. showcased the efforts of his organization on utilization of non-food (non-fodder) farm waste to biofuels as well as biogas. Mr. Agarwal drew attention to the ethanol blending program across the world and the current shortfalls to achieve targets. He went on to highlight how utilization of farm waste for production of bi-ethanol can be used to realize targets of gasoline blending which are as high as 20 percent for India by the year 2020. He also discussed efforts on conversion of cellulosic and hemicellulosic biomass into biogas by anaerobic biomethanation. Interestingly, the residue after the biomethanation process can be utilized as a green fertilizer for farms, truly adhering to the “cradle to cradle” approach for the theme of waste to wealth. On the academic side, Prof. Yogendra Shastri (IITB) nudged the discussion to the key issue of mixed nature of nonsegregated municipal waste, composed of organics, plastics, metal, sand and ash. Prof. Shastri presented key findings of his work on thermodynamics and kinetics of pyrolysis reactions and how this understanding is being used to design and optimize pyrolysis reactors for the treatment and utilization of mixed municipal waste. Prof. Shastri further discussed preliminary studies on performing environmental impact assessment of biogas production from the MSW produced in the IIT Bombay campus and their direct and indirect economic, environmental and social benefits. The concluding session of the symposium was a panel discussion chaired by Prof. Rangan Banerjee, Head of Energy Science and Engineering Department, IIT Bombay. The panelists consisted of academics, from both IIT Bombay and Monash University, as well as the industry, including Prof. Tony Patti, Prof. Victoria Haritos, Prof. Bart Follink, Prof. Yogendra Shastri and Dr. Ezhil Subbian. Prof. Rangan Banerjee set the ball rolling–making introductions to the themes and the panelists-following which each panelist was asked to make opening remarks on their perspectives and opinions on various aspects of waste to wealth. The discussion was thrown open to the delegates in the audience and an hour was devoted to brainstorming about the progress, challenges and opportunities in various waste to wealth scenarios. Multiple illustrations and case studies were cited by the panelists and delegates to highlight the key aspects of the future of waste to wealth, such as state of the art technology, commercialization strategies, scale-up and deployment challenges, policy interventions required as well as the socio-economic and environmental impact assessment. The necessity for increased collaborations between the academia, industry, NGOs and the government for the success of waste-to-wealth projects was a common opinion amongst those present. Prof. Patrick Perlmutter made a proposal to set up a consortium on waste to wealth to drive projects and initiate new programs. In response, Prof. Rangan Banerjee shared his opinion on the necessity to identify one or two specific target areas and setting up key goals and action points for successful initialization of such a consortium. The panel discussion summed up the key takeaways from the symposium for all those present. The symposium ended with closing remarks by Prof. Rangan Banerjee and Prof. Murali Sastry. The Three minute thesis talk and Poster competition by our students was held in the Victor Menezes Convention Center on 7 August 2015, Friday. The students are expected to present their research work in just three minutes. The posters are displayed by the students which shows the outcome of their research till date. The judges were Prof. Edwina Cornish, Prof. Pauline Nestor, Prof. Zlatko Skrbis, Mr. Yehudi Blacher, Mr. Mark Pierce, Dr. Kumar Iyer, Mr. Homi Khusrokhan, Ms. Annie Santhana, Ms. Sheba Sanjay and Mr. Krishna Warrier. After the three finalists were announced for both 3MTT and Poster session, the students were asked to vote for the winner in both categories (less than two years and greater than two years). These votes were taken into consideration to declare a new award called the ‘People’s Choice Award’ for Best 3 Minute Thesis Talk and Best Poster. The Best 3 Minute Thesis Talk for a student (>2y): Aditya Joshi. Mr. Kailash Satyarthi, Nobel Peace Prize Laureate, was the Chief Guest for the occasion and he delivered the Convocation Address. The Joint Ph.D. degrees were conferred to the students by Prof. Devang Khakhar (Director, IIT Bombay) and Mr. Yehudi Blacher (Deputy Chancellor, Monash University). The Annual awards function ‘Oskar Night 2015’ took place on Sunday, 9 August 2015. The venue was ‘Meluha The Fern’ Hotel in Hiranandani Gardens, Powai. The students are bestowed with certificates, cash prizes and Oskar statuettes for their performance in the Three Minute Thesis Talk and Poster presentation as well as other accomplishments throughout the year. The event was attended by eminent personalities from IIT Bombay, Monash University and Industry. Acting Consul General from the Australian Consulate, Mumbai, Mr. Simon Stringer also graced the occasion. The people who attended the event included some of the IITB and Monash supervisors, staff, students and the service providers. This was the first Oskar night for the new CEO Prof. Murali Sastry. He gave a welcome speech and invited Prof. Devang Khakhar and Prof. Edwina Cornish to say a few words. After the speeches, the awards were presented to the students by the dignitaries. This year, there were two new award categories, one was the People’s choice award for 3MTT and another was Best Conference paper. There were some cultural events by the staff as well as the students. The formal awards function ended with an announcement for the graduates to come on stage and click a photograph with the IITB and Monash dignitaries. This was followed by a sumptuous banquet. The IITB-Monash Research Academy’s annual student symposium 2014 was held on Friday, 8 August 2014. In this event, students give a 3-Minute Thesis Talk (3MTT). They are given just three minutes to present their research work; either motivation, plan, methodology for students in the first two years, or motivation, experiments and outcomes, for students in years 3 and 4 of their PhD. There was a poster session, where the students got to show their research work till date. A panel of eminent judges selected three finalists each from the above two groups of students. This time, after the 3 finalists for the 3MTT were announced, students voted for the winner in both categories (2 years). The student votes were taken into consideration along with the judges’ votes before declaring the winners. The awards were given to the students on Sunday, 10 August 2014 at the OSKAR awards function. The Best 3 Minute Thesis Talk for a student (<2y): Aditya Joshi. The Best 3 Minute Thesis Talk for a student (>2y): Nelson M.
The Best Poster for a student (>2y): Sherly M.A. The OSKAR awards function took place on Sunday, 10 August 2014 at Meluha, The Fern Hotel. The students were presented with certificates, cash awards and OSKAR statuettes for their extraordinary accomplishments throughout the year. The awards night recognises the research excellence of our students in this unique joint PhD program. The event was attended by distinguished personalities from IIT Bombay, Monash University and Industry. The Academy OSKAR event sponsors were represented at the event by Mr. Wayne Lewis, Commissioner to Victorian Government Business Office, India and Mr. Chandramouli Balaraman, Director, Cherrypick Technologies. They graced the occasion along with Mr. Mark Pierce, Consul-General of Australian High Commission in Mumbai, India. We also had many student supervisors from IIT Bombay, our professional service providers, students and staff from The Academy. Prof. Mohan Krishnamoorthy, CEO of the Academy gave a heart-warming welcome speech. We also heard some words of wisdom from Prof. Alan Finkel (Chancellor, Monash University), Prof. Edwina Cornish (Provost, Monash University) and Prof. Devang Khakhar (Director, IIT Bombay). We also had a standup comedy act in three sets from Deepak Gopalakrishnan, who provided some comic relief throughout the evening. This was followed by a lavish dinner and some merriment. The student symposium, the graduation of IITB-Monash students (as part of the IITB graduation ceremony) and the OSKAR event marks a very important weekend in the Academy calendar: a time to reflect, introspect and celebrate. And the weekend in 2014, like the ones in the years before, provided us with many moments of celebration and reflection. The Annual Student Symposium 2013 was held on Friday 9th of August. This symposium is held annually to provide the students a dais to exhibit their research work. The students give a ‘3-Minute Thesis Talk (3MTT) ‘ on this day. The younger students are judged on how the arguments and research were presented and organised and their articulation of the research problem in a concise manner. The elder students are judged on how the research findings and conclusions of the research are presented and arguments structured. The Best 3 Minute Thesis Talk for student less than two years was received by Anjali Sairaman. The Best 3 Minute Thesis Talk for student greater than two years was received by Akash Nigam. There is a poster session too where the students get to present posters on their research work and progress. Awards are given to the best posters under the Junior researcher (less than two years) and Senior Researcher (greater than two years) group. Jayesh Sonawane received the award for Best Poster(honourable mention). Karan Thanawala and Ruchi Grover Wankhede got the award for the Best Poster under the greater than two years group. The 2013 OSKAR awards event took place on Sunday 11 August 2013. Students of the IITB-Monash Research Academy (Academy) were presented with OSKARs for outstanding achievements.Set in the wonderfully decorated banquet hall at Meluha, The Fern Hotel, Powai, it was a grand event attended by luminaries like Prof. Devang Khakhar, Director of IIT Bombay, Dr. Alan Finkel, Chancellor of Monash University, Prof. Edwina Cornish, Provost of Monash University and others. Students, the staff of the Academy, industry collaborators, professional service providers and supervisors from Monash University and IIT Bombay were present. Prof. Mohan Krishnamoorthy, CEO of the Academy, presented an overview of the main achievements of the Academy for the year and officially inaugurated the evening. Certificates and awards included OSKARs for the best Three Minute Thesis Talk (3MTT) in the categories ‘less than two years in research’ and ‘above two years in research’, respectively. OSKARs were also given for the Best Poster by a junior and senior student, as well as for the Highest CPI, Best Paper and Best Thesis. Prof. Pauline Nestor, Prof. John Sheridan, Prof. A. K. Suresh, Prof. Subhasis Chaudhury, Prof. Tam Sridhar and Prof P. M. Mujumdar were among the other esteemed guests who presented the awards. Representatives of the industry partners who also attended were from TCS, and Reliance Industries. Several of The Academy’s professional service providers were part of the event as well. Stand-up comic, Deepak Gopalakrishnan, had the guests in splits throughout the evening with his fine sense of humour. Dinner was sumptuous and had everyone tucking in heartily. Those that had been enrolled for greater than 2 years and who were judged on how the research findings and conclusions of the research were presented and arguments structured. In addition students presented posters on their research work and progress, to interested researchers, guests and mystery judges. The awards were provided at The Academy Awards evening that took place on Sunday 2 December 2012. The Oskar evening is a much anticipated annual event for students academic and industry participants alike. The evening took place Sunday 2 December in the banquet room of the Meluha Hotel, Powai. True to its name, this was a night to remember. With important dignitaries like Dr. Devang Khakar, Dr. Alan Finkel, Prof Ed and Melissa Byrne, Mr David Pitt, Ms. Loren Miller, Prof. Tam Sridhar, Prof AK Suresh and Prof Subhasis Chauduri, it was truly a red-carpet evening. With anchors for the evening, Mamta Bhattacharyya and Adrian Gertler who adopted the aliases of Aishwarya Rai and Shane Warne respectively, the audience were taken through some of the highlights of the year, special moments and some comedic relief. This year there was a special award awarded to the CEO of The Academy for reaching 100 students. This was named the ‘Sachin Tendulkar Award, Centruy of Students award’ and materialised as a cricket bat duly signed by all 100+ students currently at The Academy. It was duly presented to Prof Mohan Krishnamoorthy by the first student enrolled at The Academy. Guest-speaker organized for the evening was Mr Sumant Cidambi who gave a talk on ‘Lessons for research, and in particular, a PhD scholar, from my experiences with endurance running”’. This was followed by dinner and drinks and a great time had by all. The Academy had a very busy November 2011. It was a time of ‘all hands on deck’ on MV “The Academy’ with Chief Officers Rahul Krishna and Kuheli Banerji, our cadets Rahul Ingle and Bharat Ingle and our new recruit Mamta Bhattacharyya. All under the watchful eye of Capt. Haddock, our very own CEO Prof. Mohan Krishnamoorthy seeing all of us through these rough seas. By end of the third week the Australians had arrived only this time to play on the same side as India. Our very own PHD students were presenting 3MTTs which is a three-minute thesis talk. This was very interesting and covered various topics like Human Sentiment Analysis to how fast cargoes can be stowed from the holds of ships to ware-houses through complex computations. Alongside, the posters on display were also being marked and by the end of the evening there was a short-list of names for the best seminar and best posters. There was overall good participation by the students. True to its name, this was a night to remember. It was ‘end-sem’ for most students. With important dignitaries like Dr. Devang Khakar, Dr. Alan Finkel, Dr. Kakodkar, Dr. David Pitt, Ms. Loren Miller, Dr. Sridhar, Dr. Shiv Prasad it was truly a red-carpet evening. With true MGM music back-ground Ms. Loren Miller and Mamta Bhattacharyya played anchor for the evening with a ‘holly-bolly-wood’ style of delivery. There was a guest-speaker organized for the evening Mr. Krish Ashok who gave an interesting talk on ‘the five most important things I have learnt from the internet’. This was followed by dinner and some more drinks and I think we saw quite a few satisfied faces as they all departed. The one-day energy symposium was organized by The Academy. It had speakers from faculty members at IITB and Monash University and also featured several external speakers from the Industry. This again provided a common platform for all concerned (students, professors and industry experts) to exchange knowledge on future energy challenges. The Academy conversation between the speakers carried on over dinner later. This was another experiment that worked exceedingly well. Four top academics from both the institutes came together to deliver talks in general areas of ‘bio-sciences’. Opening talk was by Prof. Ed Byrne, President and VC of Monash University. His talk was on ‘Advances in brain medicines and cross historical divide’..
Next talk was by Dr. Alan Finkel who is Chancellor of Monash University. He is an engineer, entrepreneur and a philanthropist. His topic was ‘Start-up business models’..
Third talk was by Dr. Jayesh Bellare from the Department of Chemical Engineering at IIT-B. His topic was ‘Nano bio-engineering for Healthcare’.. Finally, the last talk of the day was delivered by Dr. Dulal Panda, Department of Biosciences and Bio-engineering, IIT-Bombay. His topic was ‘Stabilization of micro-tubule dynamics induces defects in cell polarity and inhibits cancer cell migration: Implications in cancer metastases. Prof. Mohan Krishnamoorthy along with Prof. Sanjeev Sabnis respectively introduced the speakers. Prof. Sabnis gave a vote of thanks and commented that we should have many more such colloquia.. This concluded the evening and also the week-long events at ‘The Academy’. An afternoon of fun and games was organized on 22 December at our Academy for our students. Although 24 had confirmed, finally 17 attended. First item was the ‘Ice-breaker session’. Two groups were formed and each person was given a pen and a chit of paper on which they had to write down three questions. The question could not be of the obvious kind but something like favorite destination or an event in their life which impacted them. Now, each person had to ask those 3 questions to 3 different people in the group. After they completed this exercise each member from the group came up on the dais and introduced himself to the group. Everyone from the group then spoke about the person from the information they had gathered. It was a fun session. Second item was a ‘Who am I’ session and was thought-provoking. A question was put to the group. Each one was asked to think for a few minutes and reflect. They had to think of a symbol that they can identify with and explain to the group as to why they think the symbol says who they are. This exercise sort of brought about certain sobriety amongst the students and they came up with their own symbols and very interesting explanations of them. It was an interesting exercise and food-for-thought. The item that followed from this was the famous game of ‘antakshari’ but with a twist. Instead of the usual starting a song with the last letter the team had to pick up a chit on which a word was written and they had to sing a song (bollywood) which would contain that word. Both the teams performed well and it was enjoyed by all. Group singing followed from this which was fun. Finally, Ganesh Soni presented two problems in front of the students and asked them to find a solution. First one was to design a product by which one could apply powder on one’s back and the other one was how to prevent shoes from smelling on a hot and sweaty day. Teams came up with interesting solutions and funny ones like the one on powder was ‘to get a wife ‘and everybody had a laugh. After this snacks were served and everybody went back happy. 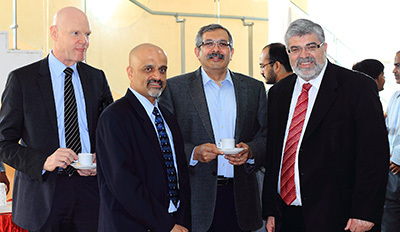 The Australian Federal Minister for Innovation Industry Science and Research, Kim Carr, visited IIT Bombay in Mumbai on 25 July 2011. He visited the IIT Bombay campus with a 5-member delegation and spent an hour and a half here. Prof Devang Khakhar, Director of IIT Bombay welcomed the Minister to IIT Bombay. He talked about IIT Bombay and talked also about the importance of the IITB-Monash collaboration. This was followed by short talks from our CEO, Prof. Mohan Krishnamoorthy, Prof Subhasis Chaudhuri, Prof Swati Patankar and Prof David Abramson (who was visiting IIT Bombay for a few days). This was followed by a response from Senator Kim Carr in which he said he appreciated what he had heard. He said he was happy to see the Academy’s progress. He also indicated that international collaborations were strong on his Government’s agenda and that he had heard the funding message loud and clear from all the speakers! Three Academy students (Amrita Poyekar, Jas Chawla and Akshaya Kumar Swain) also spoke about their work. Senator Carr was, we believe, pleased with what he had heard. Subsequent to his visit, we had an “innovation session” — The Marico-Academy Innovation event. This went off successfully too. We had nearly 100 people in attendance. At least 50% of the audience (by our estimation) were IIT Bombay students/staff. The event featured speakers from Reliance, Goonj, DNA, Innovation-Alchemy and Prof. Mohan Krishnamoorthy. 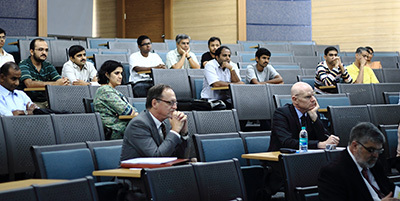 IITB-Monash Research Academy hosted its Annual Symposium between 17 February 2011 and 19 February 2011. The Symposium enabled the sharing, reviewing and exchange of ideas between researchers from IIT Bombay, Monash University and industry partners. The Symposium was based on three themes: Water, Nanotechnology and The Digital Divide. The three-day symposium presented talks by 27 speakers from industry, 31 from IIT Bombay and 28 from Monash University. Click here to view the abstracts of the speakers. The Academy Annual Symposium focused on developing common research programmes of interest to society, government and industry. The symposium presented a platform for the stakeholders of The Academy – students, supervisors and industry partners – to share views and to address the needs, goals and challenges facing society today. The symposium addressed key challenges that research and industry communities need to address in the context of the innovation eco system in India. Some of the key participants from Industry were: F.C.Kohli (Former Deputy Chairman, TCS), Aravind Sitaraman (MD-CISCO), Subrahmanyam Gopparaju (Senior VP and Head SET Labs-Infosys), Manish Gupta (Director, IBM India Research Laboratory), Adil Dhalla (Director of GE Singapore Water Technology Centre), Surendra Kulkarni (Senior Director R&D and CTO, Dow Chemicals, India), Amit Biswas (Head Technology Services and Emerging Technologies, Reliance Technology Group), Peeyush Ranjan (Director and Country Head, Google India R&D), Ajit Balakrishnan (Founder and CEO of Rediff.Com), Murali Shastri (Chief Scientific Officer, TATA Chemicals Innovation Centre), Swapan Ghosh (Director of Green Coat Chemicals Pvt. Ltd), Anant Chilkunda (CTO, Technology, Media and Telecom Business-Wipro). During the three days of the symposium, a poster session was organized by The Academy, where 25 PhD students from The Academy talked about their research to date in various inter-disciplinary fields.